Stupid warmoth can't make the neck I want in 7.25 radius. But my bridge is 7.25 radius and I can't change that. How would a 7.25 bridge we on a 9.0 or 9.5 neck? Could I also grind the saddles or shim them? Also... It will be a 12 string. I have that set up on my Shadowmaster. Your E's are elevated moreso than the rest of the strings. Not a big deal. Just put a washer underneath each E saddle... job done. I did that on my low E as I cut a deeper groove into it to prevent slippage... so heightened it for that reason. I later did on the higher E just to raise it slightly to prevent chocking on bends. I'll be using the 9.0/9.5 neck with one of these bridges though. I'm just tring to figure out if it would be worth the $100 -$200 more to have matching radius's on a 12 string. Think so? For an xii? oooooo thats sweet man. I just emailed him! With that awesomeness, someone could take a toronado bridge and get xii saddles like yours made for it and have a really decent looking xii copy. Just need to drill holes in the back of the bridge too. "The saddles are much different to the ones I currently produce and therefore would need special tooling. I am very sorry but it would not be practical for me to make one or even a few sets. Maybeee if we made a post to see how many people would buy an xii bridge, it would show enough interest and he would make them. I mean who hasn't wanted an xii bridge? 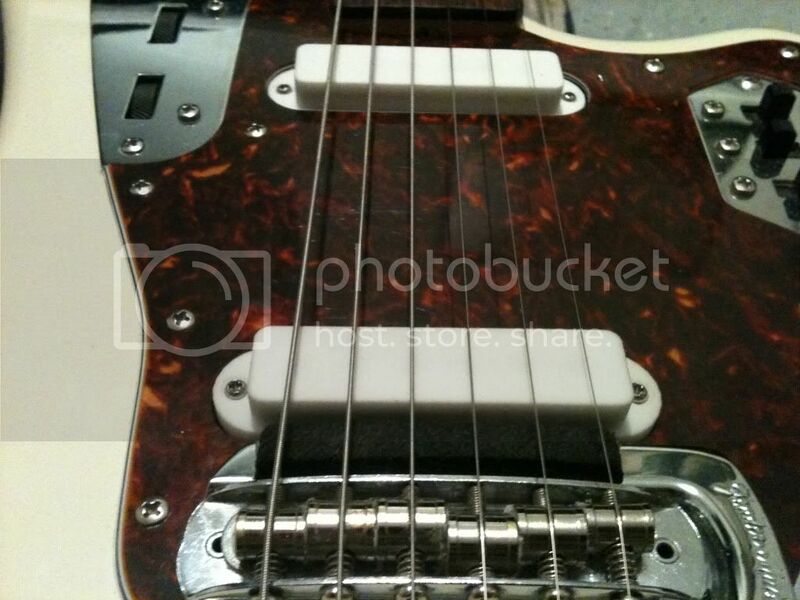 I don't�know if this will help you any, but on my Squier I put a regular Mustang bridge but instead of the low E saddle I used an A or B saddle from another set. No problem with the high E and it plays fine like this. That is a good idea! Just won't work with an xii bridge. It might if you can get hold of two more saddles. Not 100% sure, but it might.